With all the traffic buzzing around Ringsend these days, it’s a brave person who takes to the streets on two wheels. But local athlete Lydia Boylan not only managed to manoeuvre her bike down Thorncastle Street, she kept going all the way to first place at the Irish Cycling Championships. NewsFour eventually caught up with the fast-pedalling Boylan for a quick chat about her impressive journey from the cycle tracks of Dublin, to the velodrome tracks of the world. Boylan has never looked back since. She became Irish track champion in 2012 at the sprint and scratch disciplines, and then to show her versatility, won back-to-back road race championships in 2015 and 2016. 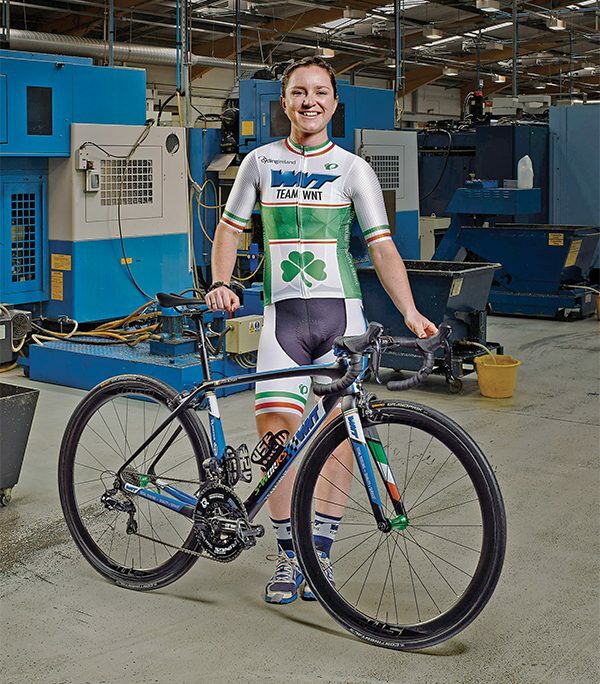 She currently competes for Ireland on the track cycling world cup circuit that takes riders to such exotic locations as Cali in Columbia, Los Angeles, and Glasgow. Yes, Glasgow can be exotic too! On the thorny subject of facilities for Irish athletes, or lack of them, Boylan has strong opinions: “A velodrome is massively necessary for the development of the sport. People need to see track cycling as a sport they can get involved in. Growing up, I didn’t even consider cycling as a competitive sport, it just wasn’t on my radar.” This points to the fact that there is no indoor velodrome in Ireland, and only one outdoor track in Dublin, which in itself is not exactly state-of-the-art. This undoubtedly goes a long way to explain why Team GB regularly return victorious from the Olympics with a haul of cycling gold medals, while their Irish counterparts are left huddling for shelter under umbrellas in Crumlin. With all the travelling Boylan has to endure on the track circuit, we wondered if she ever got the chance to enjoy it. “Yes and no. We don’t usually get to see a lot of the countries we visit but when we do it’s amazing. But the biggest aspect of travelling for an athlete is just how tiring it is and how much it upsets your training rhythm. It’s hard to get used to,” she explains. As for life after the wheels stop turning, Boylan has a plan. “I’m not sure in what capacity but more than likely I’ll go back to structural engineering, if I can remember how to do it!” We at NewsFour certainly wish her success of seismic proportions, and hope she can at least earn a decent crust in her new profession.